Abbey D’Agostino is the 2013 NCAA Cross Country Champion. The five-time NCAA victor also won 2013 NCAA titles at 5,000 meters outdoors and both 3,000 meters and 5,000 meters indoors. Additionally, she won the 2012 NCAA Outdoor 5,000 meters and was a member of the 2012 NCAA Indoor third place distance medley relay team. At the NCAA Cross Country Championships Abbey placed third in 2011 and second in 2012. She won the NCAA Northeast Region title the past three years. Abbey finished in fifth place at the 2012 U.S. Olympic Trials 5,000 meters, only 0.19 seconds behind third place and a spot on the Olympic team. She is a ten-time All-American and has won ten Heptagonal conference titles in cross country, indoor track and outdoor track. 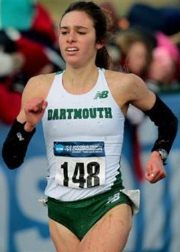 Abbey has received numerous major awards including: the USTFCCCA Female Scholar Athlete of the Year for Indoor track and Outdoor Track in 2013 and Cross Country in 2012: Dartmouth’s Top Female Student-Athlete of the Year for 2012-13 and 2011-12; and Female Athlete of the Meet Award at 2013 and 2012 Outdoor Heps along with 2013 Indoor Heps. She competed for Masconomet Regional High School, where highlights included a MIAA State Division II Indoor mile title as a sophomore and third place at the Eastern Massachusetts X-C Championships her senior year. Her personal best times are: 1,000 meters - 2:45.42; 1,500 meters - 4:16.15; mile - 4:30.03; 3,000 meters - 8:55.41 and 5,000 meters - 15:11.35. Abbey is working on her degree in Psychology and hopes to pursue graduate studies. She was gracious to spend 45 minutes on the phone after completing her term final exams. GCR: Congratulations, Abbie, on winning the 2013 NCAA Cross Country Championships. When you toed the line, from what everyone was saying and you probably knew in your heart, you were the overwhelming favorite. What was your pre-race strategy to put yourself in the best position to win and did this put extra pressure on you? AA As I’ve become more experienced and more known the name of the game for me has been keeping that pressure away from my thoughts the day of the race in preparing for the competition. It had been a big personal goal for me throughout the season and for the team to have so much success alongside the individual success I had was just incredible. For me one of my favorite parts of this sport is that cross country is also a team sport. It is a joy to share those experiences with the team and to see them gaining confidence during the season to compete at this level. We knew we had the talent level and drive to do well but it is never guaranteed that the team will have the right timing and stay injury free. That worked to our advantage and was a huge part of me maintaining my composure throughout the event. I have learned that I have to stay relaxed and keep it fun to have a good day. GCR: You mentioned having your team with you and I remember in high school it was quiet when I went to the Florida State cross country championships my junior and senior year as an individual. So it must have been really exciting to have your teammates there with you this year? AA It was super exciting for them to be with me. When I race as an individual they are with me in spirit and are incredible. They will send along little letters or will have my coach, Mark Coogan, bring along trinkets, so it feels great to have their support from across the country. But their physical presence and the amount of confidence they built throughout the season was such a great way to culminate an awesome team experience and season. It was the best way for me to end my collegiate cross country running. 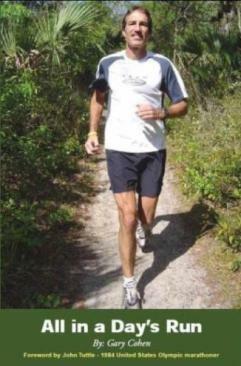 GCR: Speaking of Coach Coogan, did he give you any special advice before the race? AA I knew what I had to do and Mark and reminded me that last year when I was with Jordan Hasay and Betsy Saina the whole way there was a bit of hesitation on my part and that I didn’t completely trust myself to be the first one to make a move. This year I trusted myself and that was the big difference. That was something we discussed throughout the season. He sent me a text two hours before the race that said, ‘I believe in you,’ and hearing that from someone whom I really trust and who has a great deal of racing experience at this level and beyond was a huge confidence boost for me. It is a special relationship and I value his passion and how much he cares about the team. GCR: Let’s talk about the race. First, it was a cold, windy day and the course was muddy. Did that play into your hands as you have raced very successfully in snow and under other poor conditions in the past? AA Absolutely. My sophomore year at the Ivy League Championships it was a complete mess in the snow. I don’t know if you’ve seen anything from that race or not. GCR: Yes, I’ve seen pictures and it was hard to tell it was you. AA Oh my gosh! I was wearing wool socks, leggings and was a bit of a wreck. We were winging it as the guys had raced before us. Mark always says, ‘May the best runner win.’ That was in the back of my mind, I knew our girls were tough and we prepared with the thoughts that the conditions would affect others but not us. We are from Hanover, New Hampshire; we are hardy; and that’s what we keep thinking about when there are adverse conditions. We gritted our teeth and went for it then and that is how we approach all of our races. GCR: Back to this year’s NCAA Cross Country race where Iona’s Kate Avery established a short lead early and held a 20 meter lead after 4,000 meters over a small chase pack which included you. How were you feeling both mentally and physically through the first two-thirds of the race? Did you feel like you were under control and could make a move when you the time came? AA I did feel like that. Our plan was to move steadily and not to try and make a drastic move to pull away. Depending on how I felt I was going to move somewhere between three and four kilometers. I wanted to be relaxed and under control and also to tuck in and stay out of the wind in the first half of the race. I made sure that the gap wasn’t widening too severely in the first half. I didn’t think it was so I wasn’t worried. There was a bit of a downhill after the 3k mark and around there I started to pull away gradually from the chase group. GCR: Were there any one or two competitors whom you were particularly watching? AA I knew in particular that Emma Bates would be tough. She had a great season. Muriel Hall from Texas had been super tough. We raced at Wisconsin and she wasn’t too far behind me. I kept an eye on them and knew they were in the top group. I didn’t see exactly where they were. I was aware of them, but I also trusted my race plan. GCR: When you made your move to catch Avery and ultimately to take the lead was there any resistance or were you just stronger at that point? AA I honestly wasn’t aware of how far back they were. I knew as I pulled away that Emily from Villanova was there, but I felt okay at that point. If I had to start to push it a bit more to drop them I knew I could do that. I also knew that the last 2k was a trying part of the course with a gradual uphill. In Hanover we train every day on that type of terrain which was a boost of confidence for me. I had toughed it out two years earlier on that course so I had confidence in racing there. I visualized it and knew that was the breaking point for everyone else. It was the decision point. GCR: As you crossed the finish line what were your thoughts and what else has hit you since the race as you realize you beat all of the top NCAA women at distances from 1,500 meters to 10,000 meters who came together to compete as one in the NCAA Cross Country Championships? AA It is so rewarding, even more rewarding in cross country as it is the big one compared to track. And then I had my team there. I had been so close to winning the past couple of years, my team was there, my family was there – it was just unreal. We were so blessed with a group of women on my team who share similar values and it meant so much to be on the line with those girls. We mean so much to each other and run for each other. Many of us are people of faith and it is special that we share that. We felt we were there for a reason and it was our time to make Dartmouth shine. GCR: Many runners I have interviewed are people of faith. Does it really help you through the highs and lows of training and racing to know that you have been blessed with talent and drive, it isn’t just you and there is a higher power behind it for you? AA Yes, absolutely. I grew up in a Catholic family and was involved with students of faith in high school, but it wasn’t until I was surrounded by it in college and started getting involved in Christian groups on campus that the trip from the mind to the heart happened for me. Running was an integral part of that experience. It wasn’t until I started to feel pressure that I realized that if there isn’t an eternal purpose behind this, then why am I really doing it? It has been a huge aspect of my experience and even more so to share it with teammates. One of my best friends on the team is the one that encouraged me to go to meetings with Christian groups and I am so thankful for that. GCR: We talked about what Mark Coogan said to you before the race, so what were his first words afterward? AA I’m trying to think as it is so funny remembering the moment as I saw a teammate who was an alternate and she was just bawling. Then I saw Mark right behind her. He was sort of speechless and said, ‘That was awesome.’ He really did have faith in me and that means so much to an athlete. He is so passionate about it and instills so much confidence in us as athletes. It was a burden lifted to know that someone who had been there before really believed in me. GCR: Did you do anything different in terms of more mileage in the summer or any new intense training sessions this cross country season or was it basically building on the foundation from the past few years? AA Training was nothing drastically different. Mileage was the same and throughout the fall the biggest thing we did more of was a focus on recovery. It clearly worked well for all of the girls. We took a little more time after races to recover so we could focus on our quality workouts. That proved to be beneficial. Runners don’t’ realize the importance of recovery and sleep. As an Ivy League student sleep is one of the most important things as it takes a lot of prioritization to get sufficient sleep. Our mantra has been to stay smart and stay healthy. GCR: The last time we spoke was after the 2014 NCAA Indoor Championships. After coming off the emotional and physical high of winning two events, how tough was it to get right back at it for outdoors? AA We do a good job of making sure we enjoy that break, which isn’t too long between indoor and outdoor season, and Mark is behind that. We go on a spring break trip and that is where I was when I spoke with you after indoor NCAAs. It’s ten days and is awesome! It is a breath of fresh air after final exams and nationals. We talk about goals, have great running on trails and it is perfect timing for a team bonding and training trip. That was great to press the reset button and I didn’t start racing for a few weeks. GCR: How tough was it to defend your NCAA outdoor 5,000 meter title, especially when you were facing Jordan Hasay in her last NCAA championships on her home track with a supportive crowd? AA I was nervous for that race as when it was about to start everyone was standing up with yellow towels. It seemed like I was at a Steelers game or something. There was also a lot of build up for the race. But I kept thinking of the last time I was at Hayward Field the year before for the Olympic Trials and how much of a blast I had there. I was with Alexi Pappas and it was one of the best ten day trips ever. We just took it in at the Trials as there was no pressure, so this year I tried to relax and visualize what that was like. I was much more nervous than I normally am so the relaxation technique was good for me. There is an optimal level of arousal before races, as you know, and I need to be a little more on the relaxed side. Mark is great as an hour before the race he was telling jokes since he knows I like to be relaxed. GCR: The way the race played out, Jordan took the lead at the bell lap. What were you feeling going into that lap as the crowd was going crazy? AA When she took the lead it did surprise me at first. Then we came around the corner, she was breaking and I knew that I had another gear in me. It was a good combination so I realized I should make my move and do it fast to try to break her. She is a tough competitor but I had faith at that point. GCR: She always seems to be such a class act and you competed a lot with her. Is she one of your favorite competitors from your collegiate years? AA Oh yes, she is very reliable and tough. I value that as that’s what it takes. She was under tremendous pressure her whole time at Oregon both individually and for her team. The whole town was in love with her. I can’t imagine that being easy and she seemed to handle it very well. GCR: With your cross country title you are the first Ivy League athlete, male or female, to win five individual NCAA Championships. Is this mind-boggling that you are the only one to do this in a period of 130 years? AA I was a little bit surprised to hear that. It’s great because the Ivy League in the past few years has become very competitive and produces great quality athletes. It is special to represent that work ethic academically and athletically. It is really rewarding to represent an institution that really requires both – not that others don’t – but it’s different. It means a lot. GCR: After coming so close to making the Olympic team in 2012 you struggled much more at the USA Championships as you competed to make the World Championships team. Were you getting stale from a long period of high-level training and racing and possibly in need of a break? AA I had done a lot of racing at that point, but we had planned my schedule so that I would peak at that race. I gave it my best and at the end of the day I was out-strengthed by the women who do a bit more mileage and are more experienced. I was definitely ready for a break which I realized after I finished that race. Mark asked me if I wanted to race in Europe or take a break and I told him, ‘I think I need a break now.’ I had been going so long that I hadn’t sat down and realized I needed a break. It ended up being a great summer to have off. GCR: Speaking of breaks, you are on a winter break right now. What are you focusing on this winter as you prepare for your final collegiate indoor and outdoor seasons? AA I’m actually running a 5k this weekend in Boston to try and get a time to qualify for indoor nationals. A few of the Providence girls had the same idea and did that last weekend. I wish we had known about it. It will be nice to get the qualifying time out of the way because I tend to focus on the mile and 3k indoors. GCR: Do you to plan to defend your NCAA indoor 3,000 and 5,000 meter titles or possibly to go shorter and race the mile at NCAAs? AA I love the mile and it is so much fun. It’s different and I love racing it throughout the season. I’m not sure about the plan for NCAAs and I think we’re just going to see how it works out. If I have the opportunity to run a fast mile in the middle of the season and that’s looking good, then maybe. I’m fortunate to possibly have those choices. Last year it was a game time decision to do the 3k and5k and this year we will see how the season goes and use the same decision process. GCR: Looking ahead, will you be going for a ‘three-peat’ at 5,000 meters at the NCAA outdoor championships? AA That would be awesome. I love the 5k more than the 3k so it would be really cool to win that again. GCR: Have you given much thought to your post-collegiate plan for running, grad school, work or some combination? AA It is getting closer every day and I’ve definitely been thinking about it. When I compete with professional women runners I am noticing what I like and don’t like. I plan to run professionally next year. I do want to go to graduate school but don’t know if that is in the cards for next year. Right now I don’t think so because I haven’t done any applying (laughing). So I’m behind the eight ball there. I am definitely looking to do a Master’s program. I’m a Psychology Major, so it might be in counseling psychology or sports psychology. It would be great to have some experience in the field before I apply to grad school. GCR: Will you possibly solicit advice from women like Jordan Hasay and Jenny Simpson about selecting agents or shoe companies since they were in a position similar to yours a short while ago? AA Definitely. That is another great thing about gaining experience over the past three years as I’ve gotten to know some of these women and networking is always helpful. I will turn to others for advice and use their knowledge. GCR: Are you hoping to continue to work with Coach Coogan? AA Right now I am going to be totally open-minded about it. There is a lot to learn and I don’t want to close the door on anything. I’ve educated myself about options and there are a lot of variables to consider – where I will be and who I want to be coached by. I will stick to what I know in my heart is right. GCR: Do you think you will include competing for and with the USA cross country team as part of your professional racing plan or stay exclusively on the track? AA I’d love to compete for the U.S. team in cross country. It would be awesome. GCR: At the pro level some runners like Deena Kastor and Shalane Flanagan compete in cross country while others don’t, so you should be able to gain valuable insights as to why they do or don’t compete on the grass. AA That is so valuable as there isn’t a huge pool in the position. It will be important for me to reach out to those who have been there to help me in this specific process. GCR: As you get closer to the end of your collegiate competition, if you think back to when you first arrived at Dartmouth as a freshman, could you have ever imagined the racing success you have had? AA Absolutely not (laughing). My goals were different as a freshman. I just wanted to score points for the team and to be an integral team member. GCR: What do you have to say to high school runners who haven’t met their own expectations or realized their potential when they are trying to decide which collegiate program and coach can help take them to another level? AA I made my decision based on the team. Of course the coach was a factor and so was the school. You have to know that you are in love with the school so that even if you broke your leg you would be happy there. That is what I felt about the community at Dartmouth. Also, running has to be pursued for the fun of it, first and foremost. That is my biggest advice to aspiring collegiate runners. GCR: You are still relatively young and next steps will be to transition from success collegiately to nationally and possibly on the world stage. Do you foresee in your future staying with the 5k, increasing mileage and becoming a 5k/10k runner or is it hard to tell? AA It seems to be the trend to increase distance as people get older so I would love to give the 10k a go. I don’t see it this year, but down the road and maybe even the marathon. I love the endurance stuff. I am putting a lot of trust in my faith and all will unfold as it will. GCR: This year is the one year in the four-year cycle without an Olympics or World Championships so do you see yourself racing in Europe as Mark had suggested last year and testing the waters in a non-championship year? AA Absolutely. I think this is a great prospect to do that when I am fresh as a professional runner. I’ve never been to Europe before and it will be an awesome opportunity. Embarrassing TV pleasure I don’t watch television much now, but if ‘Arthur’ was on I totally would watch it. My teammates make fun of me for my love of young-age TV shows and movies. I’m not ashamed of it, though it may be shameful I some circles. One thing always in the fridge Greek yogurt – I love it!